Here we are are making use of the default blogger post and comment feeds.So this his Recent comments /Recent post widget can incorporate only the latest 5 results. Choose suitable location for your widget and click on add a gadget/element. Now select feeds and as shown below and enter your feed URL . If you are using Blogger , then most probably it would be like this : http://www.yoururl.blogspot.com/atom.xml. Change the URL with yours and continue . 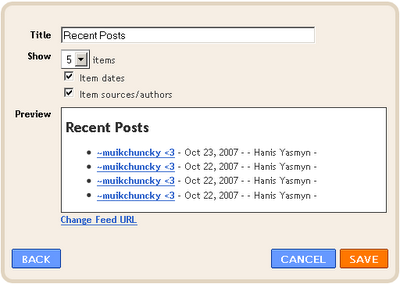 You can alter the default title with Recent comments and select the number of posts required to be displayed . For recent comment widget , the same procedure goes but with a slight difference. Instead of atom feed , we are using comments feed . That is , http://www.yoururl.blogspot.com/feeds/comments/default . Select the number of comments to be displayed and save the widget .